Remove skin and grey tissue from the salmon flesh. Cut into 1cm thick slices. Combine water, salt and sugar and whisk until dissolved and water turns clear again to create brine. Soak salmon slices into brine for 3 minutes. Flip the slices once at 1 ½ minute mark. Remove salmon slices and drain excess water. Place flat on plate and cover with cling wrap. Leave in fridge overnight. Cut up naan into rectangular strips. Ensure the strips are slightly wider and longer than salmon slices. Brush with butter and grill shortly for markings. Smear naan with thin layer of cream cheese. 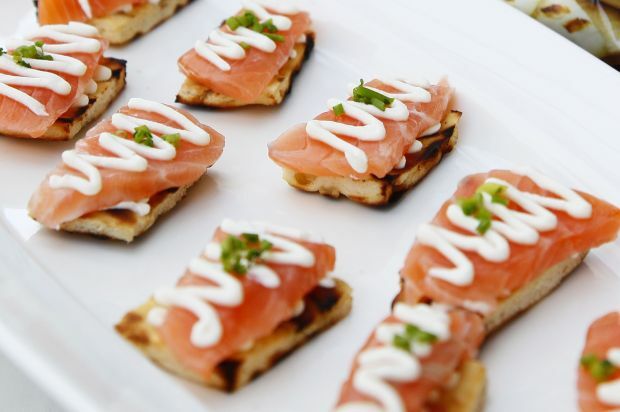 Place salmon slice on top of cream cheese.